Welcome to the last post in my review series (you can find the whole series here) of the Migard Campaign Setting. It’s been quite a journey, and we’ve encountered some strange and wonderful places, peoples and more along the way. But we’re not finished yet! Our final stop on the tour is enough to chill you to the bone: literally, as we head into the frozen wastes of the Northlands, before turning our attention to more mystical matters: the Midgard pantheon of gods and demi-gods. The Northlands of Midgard are separated from the rest of the regions we’ve encountered by the sea known as the Nieder Strait. It comprises a number of jagged peninsulas, covered by lofty peaks and frozen tundra. Clearly a land apart, the beginnings of the chapter strongly emphasises this with an extensive section on the climate, the culture and the politics. This has heavy ties to the Icelandic and Viking cultures of our own world, with of course the fantasy elements of reaver dwarves, giants, trolls, rune magic, and the Nordic (with a few twists) pantheon. The chapter continues with brief descriptions of the various small kingdoms that make up the region, an interesting mix of giant, human, dwarf and were-kingdoms. What’s not to like about an armoured polar were-bear king ruling over a mixed population of were-bears, fey bears and Vikings? As usual there are reams of interesting adventure possibilities here, some of which are highlighted in the ‘Adventures in…’ section which accompanies the description of each realm. This is a big chapter, with a large number of gods presented in different regional pantheons, roughly corresponding to the main chapters, from the northern gods (closely modelled on the Aesir of our own Viking mythology), all the way to the ancient southern powers with an Egyptian feel. One of the most interesting ideas in the chapter is the concept of Masks: that each deity as their worshipers see them may only be the aspect that the power wants them to see, and that the actual god may be something entirely different, or in fact simply an aspect of another power. This is a fascinating concept which mirrors real-world mythology, for example how the pantheon of the ancient Greeks morphed into the Roman deities, taking on aspects that were more suited to that culture. It is quite clear that Wolfgang Baur (original creator of Midgard) sees the way the gods interact with their followers in different regions as a key part of the flavour of the setting. Finally the tome rounds off (Appendix 2) with some regional random encounter tables. Whether you like this sort of material or not, it does serve to give some ideas to the monsters found in each area. And thus, after 295 pages of Midgard goodness, we are finally at the end of our epic journey!! So what next? Well the grand summary of course!! 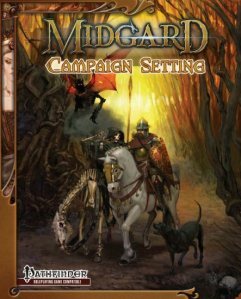 So would I recommend Midgard Campaign Setting? You bet! As easy as that? Yup! I have read and re-read this tome with great enjoyment. Obviously, I was a patron of the project, so have some bias, but I don’t think I’ve let that colour my views to any great extent. I didn’t contribute to the project, so essentially I’m just a pre-ordering customer. But to put it simply, this product delivers ideas in spades. They leap out at you page after chapter after page. I don’t like everything in the setting – I’m sure you won’t either – but what I do know is that the material gets me thinking – of epic adventures, grand cities, ancient cultures, weird magic and just plain old D&D fun. In the final analysis, that’s what a campaign setting should be about!! As I’ve posted before, I rarely run my own campaigns in published settings; I enjoy the creation of my own settings too much. However, I grew up in the RPG hobby alongside great settings such as Greyhawk, the Forgotten Realms, Dragonlance, etc. The Midgard Campaign Setting has joined that group in my mind – a iconic D&D setting ripe for plunder, and ready to become either a richly detailed background to your group’s adventures, or an inspiration for your own world and tales. This entry was posted in Midgard Campaign Setting, Reviews, World Building. Bookmark the permalink. Hi there Mark – thanks very much for commenting! I’m really glad you’ve enjoyed the series of reviews – I’ve certainly enjoyed reading and writing about the setting. It almost certainly won’t be the last time I talk about Midgard here – in fact I have a couple of posts planned on the topic of how the material might affect my own world of Tolrendor. Thanks, Tolrendor. I’ve been looking out for Part V of your review, reading through the MCS at roughly the same rate. My last few years spent DMing have been higher level, using Faerun, Sigil, Greyhawk and my own world in a great multiplanar mish mash of campaigning. Having already decided to go back to Low Levels, I very soon picked out Midgard as a distinct possibility and since purchasing it in December, I must say I am WELL looking forward to it. I have also therefore very much enjoyed your reviews. As you point out, there are so many great ideas throughout the book, that I look forward to both immersing myself in it, and working on some of those things (e.g. Runic Magic) that you rightly point out are rather scant, but which I believe contribute greatly to the tome’s interest for DMs and part-time world creators alike.